We’d love your help. Let us know what’s wrong with this preview of Into The Air by A.K. Downing. To ask other readers questions about Into The Air, please sign up. Into The Air is energetic young adult adventure set in a vividly portrayed post-apocalyptic world. I loved the idea of the underground Compounds and appreciated Downing's contrasting of their drab greyness with the overwhelming colours Mia encounters outside. Review: The prologue to Into the air was interesting, and I was intrigued to see how it would play in the wider story. We meet our protagonist Mia Bryn who lives in an underground compound in Province three like many others, however, things change when a messenger from the outside arrives to give a letter to Mia’s father. The letter contained an invitation and a request from the Academy who basically run everything in this society. They invite Mia’s father to help on the building of a city above ground and request he also brings Mia along and while she is willing to jump at any chance to escape her underground prisoner, her father isn’t so willing. While we learn that the reason people live below ground is due to radiation we don’t just have an idea of why the radiation levels are so high. After discussing it with her friend Laurel and a boy besotted with her Johnathan Mia knows she is only person who could convince Marshal to leave the compound, but she also knows if he refuses that nothing will be able to stop her from breaking out alone. When they leave the compound heading for the city site it is all of Mia’s dreams brought to life and Marshal even fills her in on aspects of history that the Elders weren’t keen on discussing, like the Legacies. Legacies were people with scientifically altered genes who connected to their province able to recall their entire history in a heartbeat but were soon forced to flee by the people. However, we do learn that the Legacy gene is passed from mother to child, so it is impossible to know how many survived, but I have a feeling Mia is going to be one of them. However, after arrived at the city site Marshal and Mia are attacked while Marshal is captured, and Mia pursued she heads for the cave she and her father stayed in before, somewhere she will be safe. While hiding in the ruins Mia comes across a young girl orphaned and alone, she decides that she must save Ezra the way her sister Iris had saved her life many years before when Iris and her mother had been taken and never seen again. Ezra tells Mia that the men from the city are responsible for her mother’s death and that her father worked on the city until he died. As we approach the 1/4 mark in the novel Mia and Ezra escape the guards chasing them by crossing the thorns only to wake in an unfamiliar cabin. The cabin belongs to Celia who has a sort of magical gift and it comes to light that Celia knew Mia’s mother Lillyanna. Celia tells Mia that her mother had a gift and that she might have one as well and while she doesn't know where Lilly is or whether she is alive she is adamant that Lilly is protecting Mia. It was a little disheartening to learn that Marshal knew that the Academy letter would arrive sooner or later, and he knew what that would mean, and he doesn't even provide Mia with the skills she will need to survive in this desolate world. After leaving Celia’s cabin Mia is confused but determined. She has learned that her parents set out a path for her to follow but she isn't allowed to know what it is. Despite Celia’s warning of the city site holding only death Mia seeks to return and rescue Marshal, however, on the return journey they encounter a mutant. As we cross the ¼ mark in the novel, Archer is protecting Mia and Ezra and he and his gang agree to take them to the cave and keep them safe from the drones along the way. However, Archer seems to know what Mia’s mothers’ necklace symbolises and asks questions about it which Mia doesn’t answer or deflects. As we cross the ¼ mark in the novel, Mia and Ezra are herded north by the mutant but are eventually captured by Archer and his men but rather than taking them back to the city site they take them further into the forest away from the drones looking for them. There is also a spark of chemistry between Archer and Mia from Archer’s understanding of what Mia wants in my opinion. While she stays with the group she is extremely suspicious of their actions and motives. Eventually after a round of questioning Mia decides to leave and take Ezra with her but being unprepared for travel in the forest she soon finds herself injured again and rescued once again by Archer. After some convincing she decides to trust him and accept his help in finding out what happened to her father and possibly rescue him. As we approach the halfway mark in the novel, the men decide to take off their tags an offence similar to treason. It means turning their backs on the Academy and everything they have valued up until this point, while most are ok with this Herc isn't and only agrees because Archer asked. Archer also begins training Mia teaching her how to use a bow and to see with her other senses not just her eyes, they seem to be learning to trust one another maybe even friendly. However, soon after they learn that drones are the only things hunting Mia assassins are too and Archer has to dispose of them before all their lives are in danger. As the group heads west Mia begins to realize how dangerous the situation she is in actually is. It is here that she begins to feel something more than companionship for Archer and she even tells him necklace belonged to her mother. I also really liked the fact that while there is a hint of a romance it is a slow burn. Despite the happiness however slight they feel vanishes when drones capture Ezra and Mia rushes in to save her and just as they are about to escape a drone aims to kill Mia but Ben jumps between them sacrificing his life for Ezra and Mia. This brings back haunting memories for Mia, but Archer is there to catch her when she falls apart. Ben’s death leaves a hole in the boys as they have known each other since childhood, and Archer decides to leave to scout ahead leaving Mia with Herc who has made it very clear that he doesn’t like Mia and would sooner hand her over to the people hunting her than work with her but only resists because of Archer. As we cross into the second half of the novel, the group continue to follow Archer’s path through the terrain until it suddenly stops where they come across a group of nomads. These nomads are people that have lived about ground for generations and Mia begins to feel like this is where she should be and wishes to stay with them. They reveal to Mia that the world has healed itself and it is safe for people to live above ground but the people in charge won’t let them because it offers them control over the people. Mia’s life is really looking up especially when Archer returns a day earlier to see her, but things are tainted for Mia by Archer relationship with Gwen and she feels like an outsider again in these moments. However, this doesn’t stop their journey as the drones have picked up their trail again and they have to leave and while Archer suggest she leaves Ezra with the nomads where she could be happy Mia can’t because she has become attached to the girl despite the fact her mere presence slows them down and put them in more danger than they would without her. As we approach the 3/4 mark in the novel, Archer finally tries to talk to Mia again about her past and reveals that Mia is a Legacy as her mother was and her grandmother before her and that he is part of a special force giving the task of protecting all the Legacies. While it seems that Mia had already known this somewhere in her heart and has denied that fact, the truth drives a wedge between her and Archer as they can never be together. Now more than ever Mia wants to run away and escape her destiny because it has led so far to nothing, but death and she doesn’t want the responsibility for the lives of others, but we can see her abilities awakening and we can feel that very soon everything is going to change. And it does, when Mia and Archer can’t stand to be apart and the moment they admit how they truly feel to one another the whole dynamic of the group changes, Herc even becomes friendlier with Mia and he is quite attached to Ezra. Despite the drone still following them, they aren’t that far from the cave and Mia is hopefully that everything will work out, but it doesn’t stop the sense of foreboding that she has. When they are almost at the cave a large group of cadets close in on them and the only way Archer was stay alive and still help Mia is be letting her be captured and praying they down kill her. When she is captured the man in charge knows what Mia is and he also knows Academy men have been helping her. After he kills Troy he demands to know who the other men are, and her silence only enrages him, and he is determined to get the information out of her one way or another. As we cross into the final section of the novel, Mia and Ezra are being taken to the Academy and when she signals Archer his hawk is injured but survives. Meanwhile, Herc and Archer are trying to find whatever it is that Marshal left for Mia and they come across an old box. In the box they find documents showing exactly what Mehgo plans to do with Mia. It turns out Mehgo has been hunting Legacies and torturing them for the location of others before killing them. Archer as part of the Pendant Guard decides he needs the help of the other guards if they are going to get Mia and Ezra out alive and many answer the call for help as it is the sacred duty. The guards help threw the tunnel pass to get to the Academy, but Mia is already there and is going to be kept as close to death as possible in order for her to give her secrets but what Mehgo doesn’t know is that Mia doesn’t actually know anything, until Archer told her she didn’t even know she was a Legacy. As the torture begins Marshal quickly gives up the location of the documents Mehgo wants but Archer already has them, and it will be a wild goose chase. However, Archer along with the 27 others have constructed a plan to get into the Academy and achieve both of their objectives, but it will be extremely dangerous especially since they don’t know who is and isn’t involved with Mehgo. In the end, the plan work but there are issues and with Porter is on their side he still has an agenda when it comes to Mia and Archer informs him that he plans to disappear with her until it is truly safe for the return of the Legacies not just Mia. The heroine, 17 y Despite the fact that this is story is written for young adults, I have to say I barely noticed, I was so engrossed with this debut novel. My resolution this year has been to read a wider range of fiction and I am enjoying the challenge immensely. I loved that Mia is a well-drawn, modern female character and although the ending of the novel didn't answer all my questions, I suspect Mia's story may continue in further novels. As the mother of a 9 year old daughter, I would be perfectly happy for Caitlin to read Mia's story. There is a hint of romance but it is entirely appropriate to the story and not overdone. I thought the novel was a refreshing change from many of the more saccharine and traditionally 'female' stories available for young adults. This one is certainly an adventure with a bit more bite. Post-apocalyptic stories always grab my attention - full front and center. Into The Air was no different! Survival is the ultimate goal of all groups when faced with an ill-fated, end of the world situation. Mia has lived her entire life underground and one look at the boy who delivers her chance to come out from below, she knows that she is destined for more than a life in the ground. At first, she's a difficult character to like but she grew on me as the story continued. After looking back, I Post-apocalyptic stories always grab my attention - full front and center. Into The Air was no different! Survival is the ultimate goal of all groups when faced with an ill-fated, end of the world situation. Mia has lived her entire life underground and one look at the boy who delivers her chance to come out from below, she knows that she is destined for more than a life in the ground. At first, she's a difficult character to like but she grew on me as the story continued. After looking back, I would probably be quite unlikable if I was stuck underground like Mia. Life above wouldn't have fared much better either as people died from the radiation or ended up kidnapped to rebuild the world for the government. Once Mia reaches the City Site, she begins to explore new things that are exciting, yet overwhelming. She steps into an adventure that far outreaches what she could have ever imagined......and it changes her life forever! Captured my full attention from start to finish - you won't want to miss this one! I really enjoy dystopian novels, and my eldest loves them too. So I was thrilled to have the opportunity to read this book! Mia has lived her life underground, but her history is definitely darker than the people around her. Her mother was taken and her sister killed when she was younger, and her father moved her to a different compound. However, her father is given the opportunity to visit the Academy, and Mia pushes to be able to go above ground with him. However, upon their arrival their situ I really enjoy dystopian novels, and my eldest loves them too. So I was thrilled to have the opportunity to read this book! Mia has lived her life underground, but her history is definitely darker than the people around her. Her mother was taken and her sister killed when she was younger, and her father moved her to a different compound. However, her father is given the opportunity to visit the Academy, and Mia pushes to be able to go above ground with him. However, upon their arrival their situation becomes her worst nightmare, and Mia is left to survive on her own. While Mia is struggling to survive, she's being hunted by a multitude of creatures and guards, because of a secret that even she doesn't know. Can she survive to help change the world? I really enjoyed this book, although I do think that it's more graphic (and more terrifying) than I would expect for a YA novel. This thrilling story had me intrigued from the start. With a unique and exciting plot Into the Air is sure to be enjoyed by readers of all genres! Downing really captures the spirit of adventure in this book. I was pleasantly surprised at how this story contained aspects from so many different genres. I think there’s something in the plot for everyone, whether you like action or romance. I also really liked Mia and Archer together! Throughout the whole book you can tell there is this constant pull, like a magnet, between them. I really enjoyed watching their relationship/bond grow throughout the novel. I am very intrigued to see what happens next after the action-packed ending. I can’t wait for book #2 to see where this story takes Mia, Archer, and Ezra next. I have to admit the beginning of Into the Air by A.K. Downing had me wondering why I wanted to read it. My daughter, a high school English teacher, had taught me to love young adult books but I was afraid this one would be something I didn't like. So wrong! I needed to read into the book to be able to come to embrace and love Mia Bryn. As I have said many times, a strong female character makes a book for me. Mia is that in this book. She is a strong, stronger than I would have ever been at 17, fe I have to admit the beginning of Into the Air by A.K. Downing had me wondering why I wanted to read it. My daughter, a high school English teacher, had taught me to love young adult books but I was afraid this one would be something I didn't like. So wrong! I needed to read into the book to be able to come to embrace and love Mia Bryn. As I have said many times, a strong female character makes a book for me. Mia is that in this book. She is a strong, stronger than I would have ever been at 17, female character. She handles being taken from the only surroundings she has ever known - the compound - and being thrust into the world, into the air. She may have thought this was what she wanted but she may have thought twice about going into the air if she had seen into her own future. This book has an amazing ending and Downing has left room for several more books in this series. I, personally, cannot wait to see how the rest of Mia's life goes. Mia has lived underground her entire life. The only time she has ever been above was ten years ago, and that was only long enough to jump to another compound. She remembers how it felt and would give anything to live in the air. When Marshall, her dad, gets a letter requesting he and Mia report to the new City Site, even though Marshall is hesitant, Mia sees this as her one and only chance to be free of living underground and she’s not going to let it pass her by. On their journey to the City Si Mia has lived underground her entire life. The only time she has ever been above was ten years ago, and that was only long enough to jump to another compound. She remembers how it felt and would give anything to live in the air. When Marshall, her dad, gets a letter requesting he and Mia report to the new City Site, even though Marshall is hesitant, Mia sees this as her one and only chance to be free of living underground and she’s not going to let it pass her by. On their journey to the City Site, Mia is overwhelmed by sights, sounds, and smells she had never experienced before. Her adventure had begun. But upon reaching the site, Mia discovers a different adventure that she is totally unprepared for, one she had been unknowingly destined to take. It’s hard to believe that this is the author’s first book. She captured the spirit of each character so well, that you would think came from years of writings. I loved the storyline, the strength of the characters, and the slow development of true love. This is a series and an author worth reading. Into the Air is set in a very distant dystopian future where the world has been ravaged by nuclear explosions that has left the survivors living underground for the last 100 years. As you can imagine living underground would be unbearable - dark and dank and just plain miserable in my eyes. We meet Mia Bryn - a sixteen year old girl who has lived underground all her live until one time when she was ten year old she and her father moved compounds - unheard off at the best time going out the compou Into the Air is set in a very distant dystopian future where the world has been ravaged by nuclear explosions that has left the survivors living underground for the last 100 years. As you can imagine living underground would be unbearable - dark and dank and just plain miserable in my eyes. We meet Mia Bryn - a sixteen year old girl who has lived underground all her live until one time when she was ten year old she and her father moved compounds - unheard off at the best time going out the compound but moving compounds even more rare! One day a letter arrives for her father - an invitation to go the Academy - this opens up a myriad of questions for Mia - what is the world like outside the compound? How did this messenger survive to deliver the letter? Is it safe to live outside the compound? What ensues leaves Mia fighting for her live in a world that is based on lies and control. This was a fantastic read though I felt the ending came to head rather rushed and somewhat suddenly. A good portion of the book sees Mia fighting for survival with a group of trackers protecting her as she makes her way back to the City Site. I felt I was left with a lot of questions and I really hope there is another book to follow up with this. Overall I love the book. I love the imagination of the story, the world building and the build up to what was going on and what had to go down. I loved Ezra and all the exploration. I loved the newness and the description of things. And I loved Archer. So what drove me batty sometimes? Mia at the beginning of our tale. She came off as one that wanted things her way, quick to judge and do what she wanted but also she was whiney at times. Don’t get me wrong she grew on me and in the end as she re Overall I love the book. I love the imagination of the story, the world building and the build up to what was going on and what had to go down. I loved Ezra and all the exploration. I loved the newness and the description of things. And I loved Archer. So what drove me batty sometimes? Mia at the beginning of our tale. She came off as one that wanted things her way, quick to judge and do what she wanted but also she was whiney at times. Don’t get me wrong she grew on me and in the end as she realized more and more what she was doing and gained perspective I really liked her it was at the beginning of the tale she drove me batty. What is our story about? Mia and her father live underground. Only her dad is hiding something. He is keeping Mia safe. Mia doesn’t like being underground because she felt it was suffocating. She was self sufficient and also a adventurer. A letter comes and changes her world. Her and her dad are going to the new city site. Here we get some great descriptive writing. We see what the world looks like about ground through Mia’s eyes. We see her dad come alive but also begin to let Mia know more history. Only these two don’t exactly get welcomed. No they are torn apart and Mia is on the run and in danger. She doesn’t know why but she is? Her dad still protecting her as they attacked told her to go somewhere and that is supposed to be her intention. Only her stubborn ways has her wanting to go back and get her dad out. Mia, along the way, saves a little girl from a horrible fate and gains a friend and companion to travel with. Ezra is the little girl and she does wrap around your finger. Secrets of who Mia is are slowly brought to the surface as they are on the run from the guards. Only a group of Academy guards help her along the way. Who adds more mystery to Mia’s world and begins her journey in finding out who she really is? Celia. Celia is this little cute elderly lady that is gruff but helps keep Mia safe at one time. She begins the process of Mia finding herself. Once she leaves Celia she sees that there is now only one way to go not because it is what she wants but because any other way leads them into more danger. And how do her and Ezra survive the woods? Archer and his men. For some reason Archer wanted to help her. Mia is wary of them of course but without them her and Ezra would die. What are Archer and his men like? Archer comes off as arrogant but it is more he is self confident. He risks alot for Mia and in the end takes his friend’s advise and lets love in his heart. The love of Mia and that does change things at the end. Archer is more than just an Academy guard and it shows. As we learn his secrets and his sacrifices you just go to mush for him. Him and Ben are the two I love the most. Ben was so easy going and sweet. Finn is to but it takes awhile to see his personality. Ben’s comes right away. At times Mia questions Archer’s choices but as things unfolds she sees what he was doing. Along the journey the danger intensifies and secrets are discovered. Mia discovers things about her mother and her family. She sees what the night her family was attacked meant. She also learns that she can’t always do everything herself and learns to accept help. She learns to trust Archer and his men as they bring her on a journey into finding the truth behind why she is wanted and who she really is. I feel like the era of great dystopian novels are truly upon us. A.K. Downing easily transports you into the world of Mia, the story’s determined heroine, where life is drab and filled with rules. Mia, strong-willed and yearning for more, excitedly faces her new pre-orchestrated path to the unknown, which is above ground, completely different from where Mia’s father, Malcolm and Mia have spent the majority of their lives. Any reader is immediately propelled into a page turning quest while Mia an I feel like the era of great dystopian novels are truly upon us. A.K. Downing easily transports you into the world of Mia, the story’s determined heroine, where life is drab and filled with rules. Mia, strong-willed and yearning for more, excitedly faces her new pre-orchestrated path to the unknown, which is above ground, completely different from where Mia’s father, Malcolm and Mia have spent the majority of their lives. Any reader is immediately propelled into a page turning quest while Mia and her new found responsibilities face their pre-ordained place in this world with compassion, courage and a sense of purpose. What an adventure this story was. I really enjoyed reading this and getting to know the characters. They were all great and very well written. I really didn’t like Mia at first but when I got to know her better she became my favorite character in this story and fun reading about her journey through the book. A very well written coming of age story that any young reader should enjoy. Hope there will be more to come. I received a ARC of this book from BeckVelly Book Tours to give a honest review. What an adventure this story was. I really enjoyed reading this and getting to know the characters. They were all great and very well written. Loved this book! The plot was unique and interesting. I enjoyed following Mia's journey and watching her relationships with her guard develop. One of my favorite books to read and reread! I'm always a little nervous when starting a new book. Will I like the characters? Will they become like my own family? Will I get so swept up in the story the world will melt away around me? This book absolutely blew me away. Mia, a girl who has spent almost all her life below the ground, How could I possibly identify with her. Yet reading this, your heart begins to ache for Mia and the life she has been forced to live. Each new experience she has brings with it a new appreciation for things we I'm always a little nervous when starting a new book. Will I like the characters? Will they become like my own family? Will I get so swept up in the story the world will melt away around me? This book absolutely blew me away. Mia, a girl who has spent almost all her life below the ground, How could I possibly identify with her. Yet reading this, your heart begins to ache for Mia and the life she has been forced to live. Each new experience she has brings with it a new appreciation for things we take for granted every day. You find yourself marveling over the little things - trees, the scent of fresh air, moist dirt, birds singing. An amazing and beautifully told story of courage and hope in the face of the unknown, Into the Air is a must read for anyone who enjoys getting lost in a good book. This was certainly a different kind of book with a very interesting premise. The earth as we know it was made uninhabitable by radiation caused by war between nations. Those that survived were sent to live in underground compounds. Those affected, well they either died or were forced to live on the surface of the earth. The leaders used people to start rebuilding--even when it meant stealing them from their families. Life underground was horrendous--food shortages was the least of their problems This was certainly a different kind of book with a very interesting premise. The earth as we know it was made uninhabitable by radiation caused by war between nations. Those that survived were sent to live in underground compounds. Those affected, well they either died or were forced to live on the surface of the earth. The leaders used people to start rebuilding--even when it meant stealing them from their families. Life underground was horrendous--food shortages was the least of their problems. Mia, the central figure in this tale hates it and when a letter came to her father asking them to go to an above ground installation she begged and begged him. They went---but----That's it folks--you will have to read this book to learn what happens and ultimately why! This YA adventure/romance novel is a good choice for anyone who enjoyed Clarke’s discovery of an uninhabited earth in The 100, the romance of Sasha and Thomas in Tandem, and Rachel’s quest to find her father in Defiance. Into The Air introduces the reader to a broken world trying to repair. Mia and the new friends she meets are characters you like, root for and want to follow thru their adventure; and hopefully in more stories to come. Growing up in the hills of southwestern Pennsylvania, Aimee spent her summers A.K. 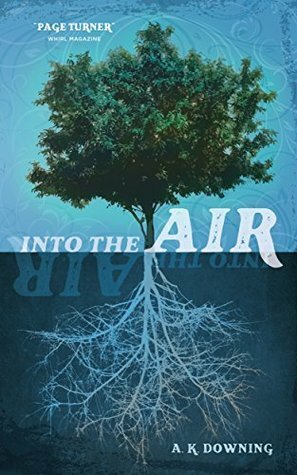 Downing's young-adult novel, Into the Air, is a 2017 National Indie Excellence Award Finalist. Set in a post-apocalyptic world, the story follows the adventure of teenager Mia Bryn as she leaves the safety of her underground compound and tries to survive in a world no one has inhabited for more than a hundred years. Please visit her at AKDowning.com.